What do babies seem to want? Copies of What Mothers Do can be ordered online from www.littlebrown.co.uk and www.amazon.co.uk. What Mothers Do has been translated into Spanish. Naomi Stadlen, traducción Elena Barrutia Garcia. What Mothers Do has been translated into Greek. 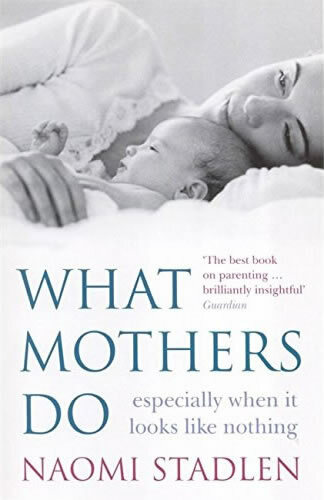 The US edition of What Mothers Do. What Mothers Do has been translated into Japanese. 2012 Poplar Publishing Co. Ltd, Tokyo. What Mothers Do has been translated into Romanian. 2013 Editura Litera Publications, Bucharest. What Mothers Do has been translated into Italian. 2012 Bonomi Editore, Pavia, Italy. What Mothers Do has been translated into Hebrew. 2013 Achiasaf Publishing House Ltd, Netanya, Israel. What Mothers Do has been translated into German. 2016 La Leche Liga Deutschland E.V. What Mothers Do has been translated into Chinese by Ricky Liu and will be published on 1 June 2017 by China Economic Publishing House, Beijing100037, China.